Get out all of Dad's t-shirts, the more colors the better. Turn any with graphics inside out and give two to each actor, one for a tunic and one for a turban, veil, or head-scarf. Belt with ropes or bandanas or fabric scraps. Angels should have white shirts with paper wings stapled to the backs. Mary should be in blue. Herod needs a crown. Mary should have a baby doll hidden under her dress. A stick horse or a rough cardboard cutout makes a great donkey. Shepherds can hold long sticks. Look around the house for containers for the gifts of the 3 wise men. Perhaps a vase, a wooden box, and a metal bowl. Set up in the common room of your house. Try to un-clutter one side of the room and have the non-participants sit facing this way. For the stable you just need a roof of some sort, it could be a large piece of plywood or cardboard with one end on the floor and the other end resting on two chairs, or a sheet hung from the ceiling and pulled back and secured at the bottom with books or chairs to create a triangle space. It should have a large star hung above it. Decorate the stable area with stuffed animals and a cardboard box manger filled with a yellow or brown blanket or towel. Each innkeeper can hold up a piece of cardboard or a large (but not too heavy) book for Joseph to knock on. This nativity play was written by Kendra Anne Tierney, mother of five. Taking the text almost completely from Scripture she has created this lovely script which will be be an aid to families in their celebration of Christmas. Narrator: In those days a decree went out from Caesar Augustus that the whole world should be enrolled. This was the first enrollment, when Quirinius was governor of Syria. So all went to be enrolled, each to his own town. And Joseph too went up from Galilee from the town of Nazareth to Judea, to the city of David that is called Bethlehem, because he was of the house and family of David, to be enrolled with Mary, his betrothed, who was with child. Joseph leads Mary and the donkey from the back of the room. 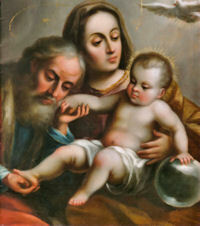 Joseph: There it is Mary, we're almost there. Joseph: Now we'll find a place to stay for the night. Here's an inn. Joseph: Do you have any room for us? The 1st innkeeper opens the door. 1st Innkeeper: Sorry, no room. 2nd Innkeeper: Sorry, we're all full. The 2nd innkeeper closes the door, Joseph goes to the next door and knocks, the 3rd innkeeper opens the door. 3rd Innkeeper: We're full too, I have no rooms to offer you, but I see that your wife is with child. Would you like to stay out back in the stable? It isn't much, but it will keep you out of the cold. Joseph: Thank you, we will gladly take anything you can offer us. Joseph and Mary walk to the stable. Mary: I'm sure it will be fine, and I think we've arrived just in time. Narrator: While they were there, the time came for her to have her child, and she gave birth to her firstborn son. She wrapped him in swaddling clothes and laid him in a manger, because there was no room for them in the inn. Mary removes the baby from her dress, wraps him in a blanket, and lays Him in the manger, then lays down next to Joseph to sleep. The shepherds stand in another part of the room. Narrator: Now there were shepherds in that region living in the fields and keeping the night watch over their flock. The angels walk up to them. 1st Angel: Do not be afraid; for behold, I proclaim to you good news of great joy that will be for all the people. For today in the city of David a savior has been born for you who is Messiah and Lord. And this will be a sign for you: you will find an infant wrapped in swaddling clothes and lying in a manger. All Angels: Glory to God in the highest and on earth peace to those on whom his favor rests. 1st Shepherd: Let us go, then, to Bethlehem to see this thing that has taken place, which the Lord has made known to us. The shepherds walk around the room, arriving at the stable at the end of the song and kneeling down before the manger. Joseph and Mary kneel down with them. Narrator: So they went in haste and found Mary and Joseph, and the infant lying in the manger. When they saw this, they made known the message that had been told them about this child. All who heard it were amazed by what had been told them by the shepherds. Then the shepherds returned, glorifying and praising God for all they had heard and seen, just as it had been told to them. The shepherds go sit down. Herod and his scribes stand in the front of the room, off to the side away from the stable. The 3 Wise men walk from the back of the room to the front. 1st Wise Man: Where is the newborn king of the Jews? We saw his star at its rising and have come to do him homage. Scribe: In Bethlehem of Judea, for thus it has been written through the prophet: 'And you, Bethlehem, land of Judah, are by no means least among the rulers of Judah; since from you shall come a ruler, who is to shepherd my people Israel. Herod: Go and search diligently for the child. When you have found him, bring me word, that I too may go and do him homage. Narrator: After their audience with the king they set out. The 3 Wise men walk slowly around the room, arriving at the stable at the end of the song. The 3 Kings give high-five. Narrator: And on entering the house they saw the child with Mary his mother. They prostrated themselves and did him homage. The 3 wise men kneel down before the manger. Narrator: Then they opened their treasures and offered him gifts of gold, frankincense, and myrrh. Each wise man offers his gift to Mary in turn, then walk a little way away from the stable and lie down to sleep. The angel comes and whispers in the ear of one wise man. Narrator: And having been warned in a dream not to return to Herod, they departed for their country by another way. Narrator: And Mary kept all these things, reflecting on them in her heart. During the final song, all participants make their way up to the front of the room and take their bows.